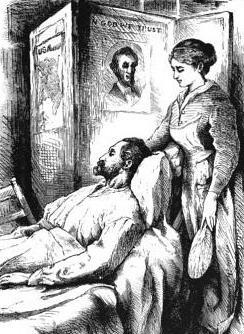 From an 1897 edition of Alcott's "Hospital Sketches"
In part one of this particular tale, I related Louisa May Alcott’s decision to become an Army Nurse during the Civil War. Her experiences were recorded both in her journals (published in 1989) and her semi-autobiographical novel Hospital Sketches, first published in 1863. Hospital Sketches is a wonderful source for those interested in the roles that women played during the Civil War. It must be taken with a grain of salt. Alcott was a novelist and no doubt a good deal of the book is dramatized. But it is also quite clear that her brief experience as a nurse made a deep impression on her and there is no mistaking her sincerity in describing the tribulations of the wounded. When last we left Nurse Alcott (although she calls herself Nurse Periwinkle in the book), she had just reported for duty at the Union Hotel Hospital in Georgetown, ironically, on the very day of the Battle of Fredericksburg. The following, taken from Hospital Sketches, describes some of what she experienced over the ensuing weeks. (I should mention that these passages have been seriously condensed for brevity’s sake but they are still faithful to her words). Sudden summons in the grey dawn, startling for a three days nurse like myself. I had rather longed for the wounded to arrive…but when I peeped into the dusky street lined with carts unloading their sad freight, I indulged in a most unpatriotic wish that I was safe at home again…I reached the main hall and paused to take a breath and a survey. There they were, so riddled with shot and shell, so torn and shattered…The sight of several stretchers, each with its legless or armless occupant admonished me that I was there to work, not to weep. So I corked up my feelings and went to the path of duty. “Come, my dear, begin to wash them as fast as you can. Scrub them well, put on clean shirts and the attendant will finish them off and lay them in bed.” If she had asked me to dance a hornpipe on the stove funnel, I should have been less staggered. To scrub some dozen of these men was really…really…However there was no time for nonsense. I clutched my soap manfully and made a dab at the first dirty specimen I saw. I chanced to light upon a withered old Irishman who did nothing but roll up his eyes and bless me in an irresistible style which was too much for my sense of the ludicrous, so we laughed together. …crazed by the horror of that dreadful battle. His mind had suffered more than his body. For days he had been re-living the scenes he cannot forget. As I sat by him, endeavoring to sooth his poor distracted mind, he lay cheering his comrades on, hurrying them back, then counting them as they fell around him, often clutching my arm to drag me from the vicinity of a bursting shell. His face is brilliant with fever while an incessant stream of defiant shouts, whispered warnings and broken laments poured from his lips. But the pails were gone to be refilled and it was some time before they reappeared. With the first mugful I hurried back to him. He seemed asleep, but something in the tired, white face caused me to listen at his lips for a breath. None came. I touched his forehead. It was cold. Half an hour later, the bed was empty. It seemed a poor requital for all he had suffered and sacrificed. That hospital bed, lonely even in a crowd. For there was no hand to lead him gently down as he vanished. I felt bitterly indignant at the carelessness of the value of life and the sanctity of death. Am ordered to keep to my room being threatened with pneumonia. Hours begin to get confused, people look odd. Queer faces haunt the room and the nights are one long fight with weariness and pain. Letters from home grow anxious…The doctors lift their eyebrows and nod ominously. They want me to go home, but I won’t yet. Was amazed to see a grey headed gentleman enter my room this morning and at the sight of him my resolution melted away. My heart turned traitor to my boys. And when he said, “Come home,” I answered, “Yes, father,” and so ended my career as an army nurse. As I mentioned in part one, some criticized Alcott for glorifying her short month of service. After reading of the hardships she endured and the suffering she eased, I think Alcott and all nurses who served during the Civil War deserve a heap of credit, no matter the length of service. Sources: The Journals of Louisa May Alcott, (1989) ed. Joel Myerson and Daniel Shealy; Hospital Sketches and Camp Fire Stories, (1909) Louisa May Alcott.